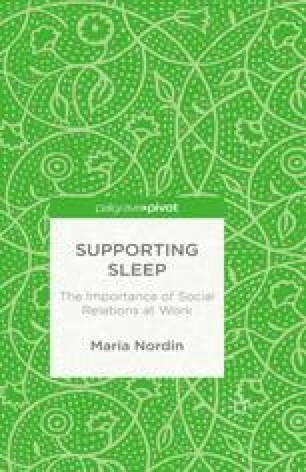 This chapter presents the working life in which social support occurs. Work is important since, among several reasons, belonging to a group is crucial for well-being. Social support is a health-bringing psychosocial work factor and is important in the demand-control-support model, the effort-reward imbalance model, the job demands-resources model, and other psychosocial work factor models. The importance of organization, leadership, and followership is presented, as are health consequences of a poor psychosocial work environment. Gender aspects are also of interest since men and women are found in different workplaces and at different positions at work. Moreover, men and women differ in work-related health. Finally, the consequences on work environment of the change from an industrial society to a knowledge-intense society are mentioned.